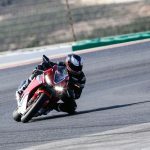 Cresting the top of the steep incline leading onto Portimao’s main straight, I’m committed to keeping the throttle on the new 2017 Honda CBR1000RR to the stop. 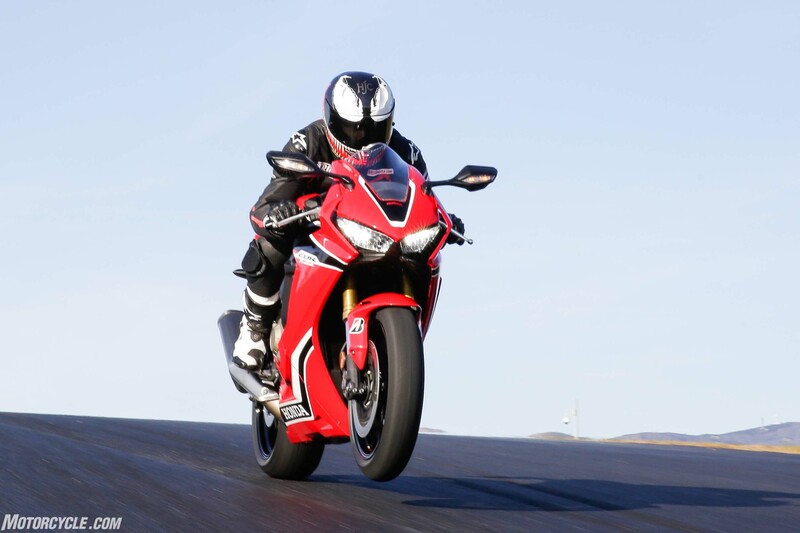 With fifth gear clicked, the front wheel starts to reach for the sky. Unfazed, the throttle stays pinned, ready for the wheel to eventually come back to earth. The wait feels like forever, and my view is increasingly filled with sky instead of tarmac. I can’t wait for the Honda’s wheelie control any longer, so a click to sixth gently brings the front Bridgestone back to the ground. 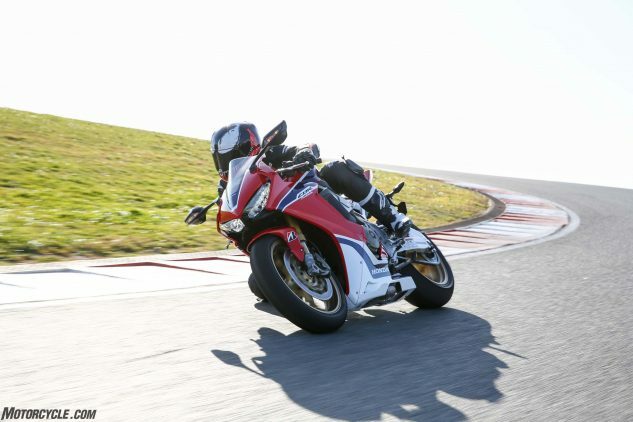 The Fireblade flexes its muscles, tickling 180 mph down the straight. Then it’s time to scrub speed down the hill before hitting the dip signaling the apex of turn 1. The short chute to reach turn 2 is quickly gobbled up before a moderate amount of brakes are applied to navigate through the hairpin. From there, it’s another flick to the left, and we’re driving uphill towards the crest of turn 3, knee on the ground, rear tire spinning ever so slightly. 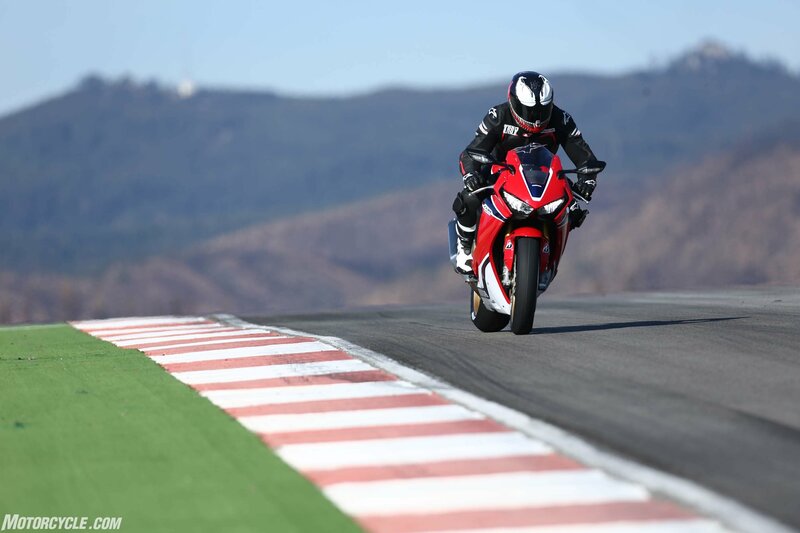 And so describes one of the many exciting sequences at the Algarve International Circuit, better known as Portimão. Due to its extreme elevation changes and blind-crest corners, it’s the closest track to a rollercoaster I’ve ever experienced. And it’s an ideal testing ground to put the new Fireblade through its paces. 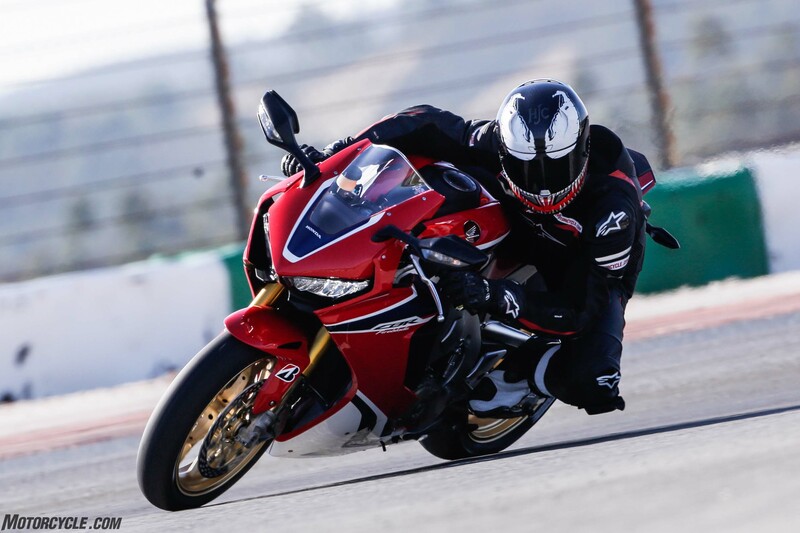 Here, in this extreme environment, the new Fireblade definitely displays some of the traits we’ve loved about the CBR lineage – particularly the engine and chassis – but as first-timers (and late bloomers) to the sportbike electronics game, the 1000RR is a bit unpolished. Wait, what? Trust me: for a company like Honda, that’s as unbelievable for me to write as I’m sure it is for you to read. But more on that in a bit. First, let’s shift our mindset slightly. 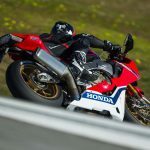 To better understand the CBR, we need to understand where the engineers designing it were coming from. 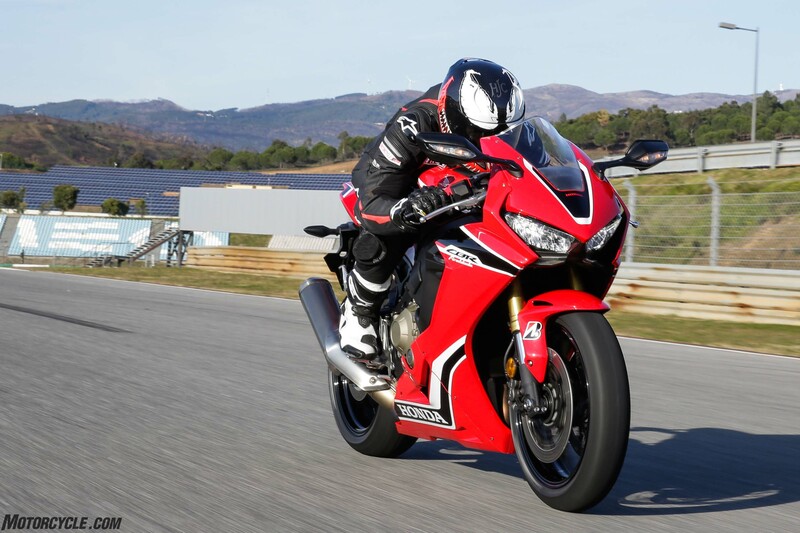 Unlike the other players in this highly competitive liter-class sportbike category, Honda’s objective wasn’t to chase that elusive 200-hp mark. 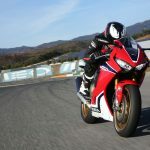 Yes, the new ’Blade is claimed to make more than 10 hp over the outgoing model, but the overall design focus has gone back to its roots, the CBR900RR, and centers on the concept of Total Control. 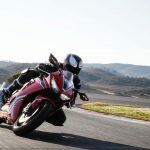 Putting control back to the hands of the rider means pairing modest power gains with significant weight loss, revised suspension, and chassis tuning to create a motorcycle that’s easy to ride while providing excellent feedback. The finishing touch, of course, is a sophisticated electronics package – centered around a Bosch IMU – to help you stay upright and as safe as possible, whether you’re track riding or blasting in the canyons. What was strange, however, was that throughout our time with Honda’s staff and engineering personnel, Honda’s Total Control ethos was never mentioned in relation to achieving outright lap times. 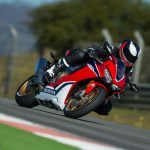 But does that mean the new CBR isn’t a track weapon? No way. 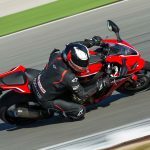 We, the motorcycling public, have been clamoring for a new ’Blade with more power and an electronics suite just like its competitors. 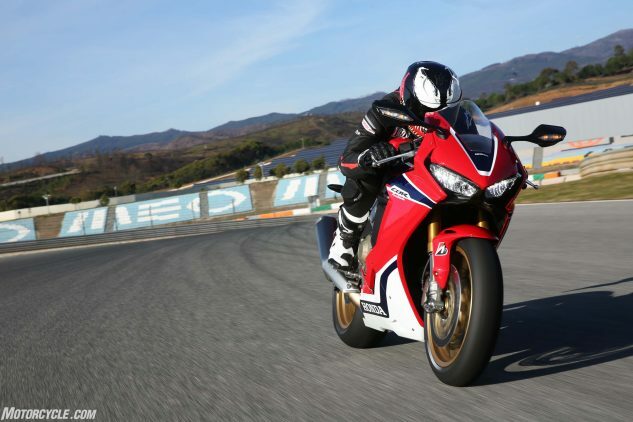 And for the most part Honda’s latest version of the CBR1000RR delivers. 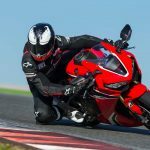 With motorcycles as it generally is with humans, when the goal is to lose some weight, having a target to meet helps bring focus to the task at hand. 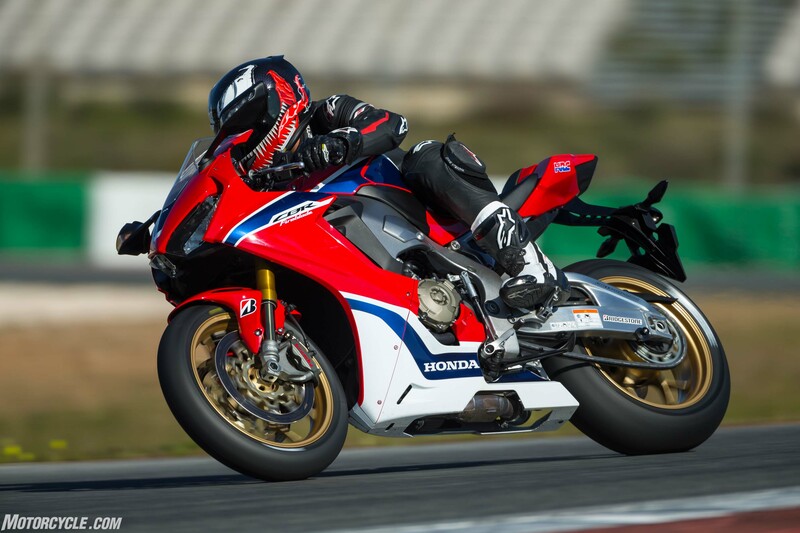 In Honda’s case the magic number laid forth for the new ’Blade was 195kg, or 429 lbs. To achieve the weight drop, every single piece of the motorcycle had to be looked over with a fine-tooth comb, including small items like nuts and bolts. Meanwhile, solutions to bring down weight for big items like fuel tank, exhaust, and chassis involved employing some creative thinking. 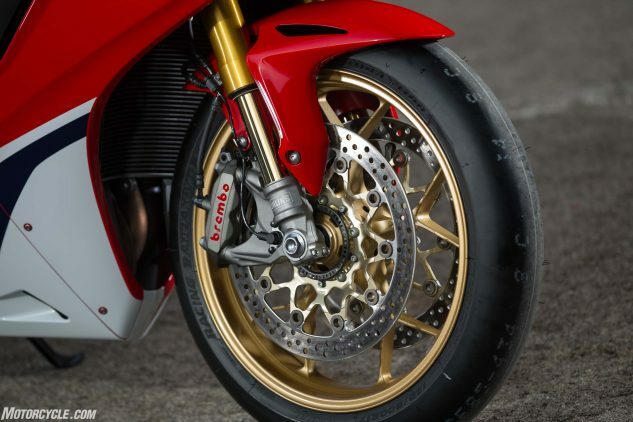 In the end, items like shorter and lighter bolts were used where possible, along with a titanium exhaust, titanium fuel tank (for SP models), magnesium engine covers, aluminum subframe, smaller radiator, and thinner frame walls are just a few of the techniques Honda engineers used to meet that ambitious weight target. 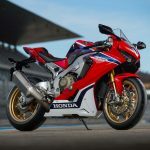 But here’s just one more example of Honda rethinking every component: the fairings on the new CBR are now just 1.8mm thick, versus the 2.0mm plastics seen on the predecessor. All in an effort to shave precious grams. About the only exotic materials you can see in this picture of the SP are the titanium exhaust canister and magnesium crankcase cover. But the quest for weight savings go far greater. 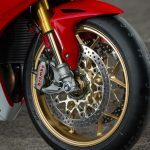 Don’t forget the titanium fuel tank (steel on the standard model), aluminum subframe (which, granted, is partially visible), hollow transmission shafts, and even thinner fairings compared to the old bike. Engine-wise, the CBR’s Four is 4.4 lbs lighter than before, thanks in part to magnesium covers and hollowed-out transmission gears and shafts. 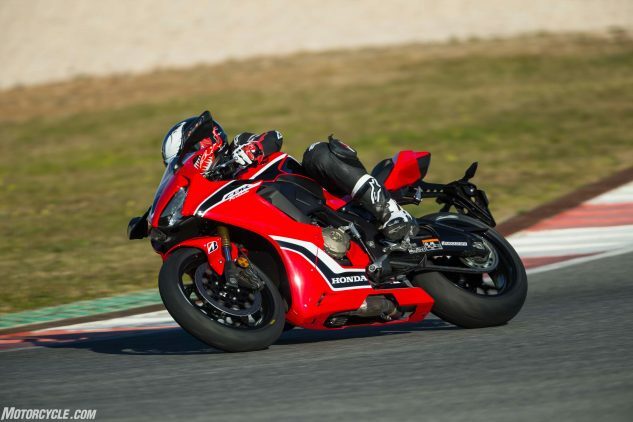 There’s a jump in power over the old bike via new pistons, higher compression ratio (13.0:1 vs. 12.3:1), a new crankshaft, new valves, a re-worked cylinder head and revised camshafts with increased lift. Valve timing is also revised to suit the engine’s new 13,000-rpm redline, 750 rpm higher than before. 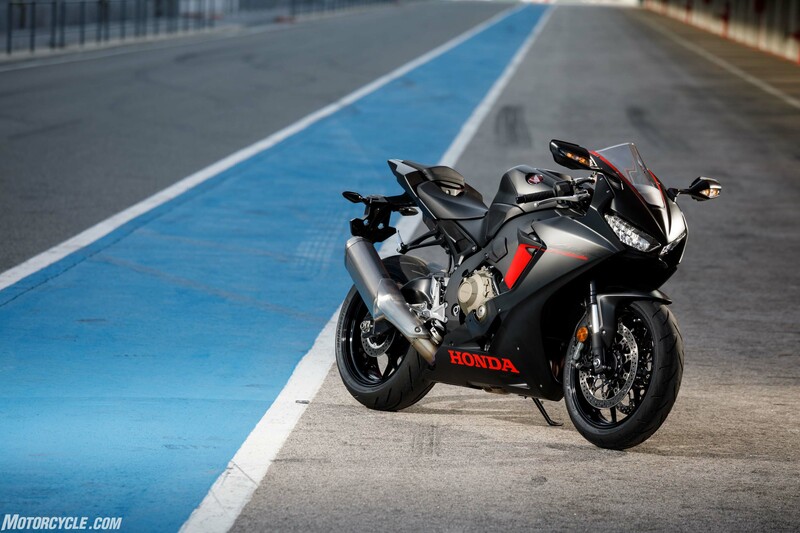 The ’Blade becomes the first inline-Four from Honda to receive ride-by-wire technology. 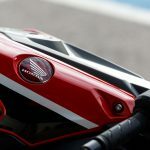 Conveniently for us, we don’t have to wait until we get a unit home to put it on the scales because Honda had a set of scales available for us to measure the pair of new CBRs. 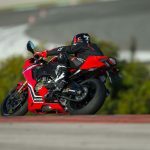 Ready-to-ride and with a full tank of gas the base model, fitted with the standard Bridgestone S21 tires, came in at 425 lbs; while the SP model, fitted with Bridgestone V02 racing slick tires specially for this test, weighed 427 lbs. 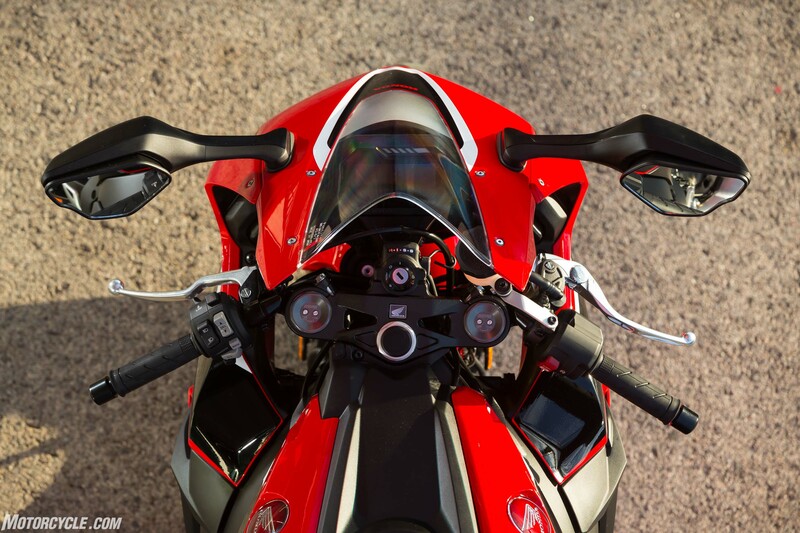 The cockpit of the standard 1000RR greets you with an informative and clear TFT display. In front of that is the familiar sight of Showa’s Big Piston Fork. To the right sits the starter, encased in the housing for the throttle position sensor. Lastly, to the left lie the buttons to toggle through the menu settings to make changes. 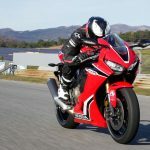 According to Bridgestone staff on hand, the V02 tires weigh a combined 24.6 lbs, while the RS10 that would normally be fitted on SP models weigh a combined 23.0 lbs. Take the weight of the tires into consideration and the standard and SP models weigh the same and are both under the original target weight of 429 lbs. 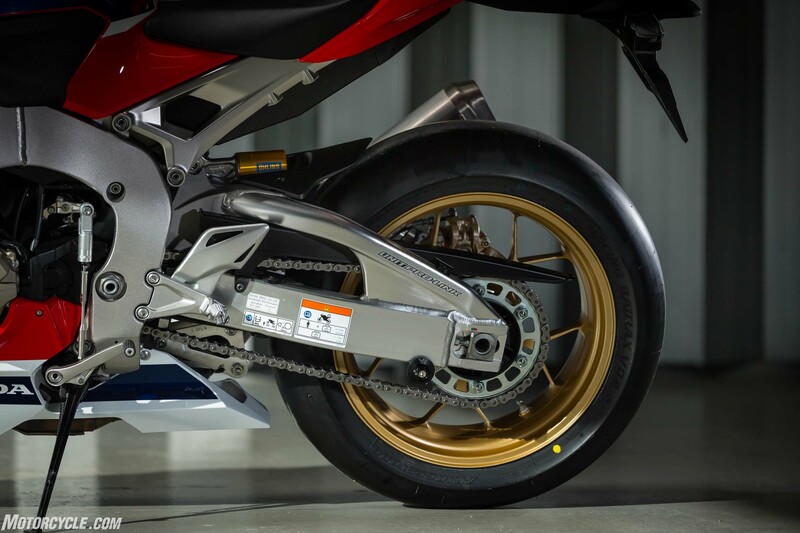 Remember, too, that the measured weight for the SP model includes the Ohlins electronic suspension and the associated hardware it carries, making its identical weight measurement to the Showa-suspended standard model rather impressive. 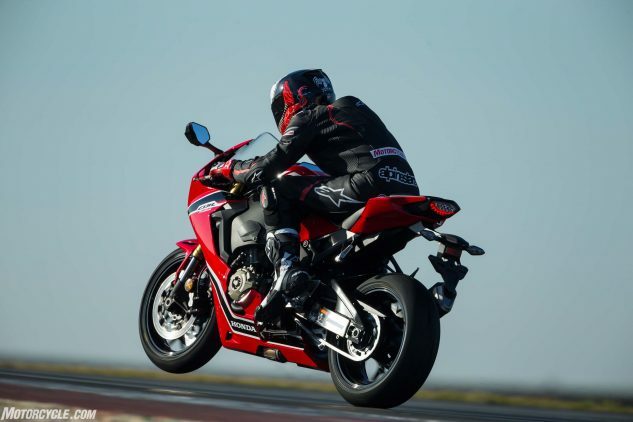 MO historians might be scratching their heads because, as we noted in our street portion of the 2015 Six-Way Superbike Shootout, the CBR1000RR tipped our scales at 444 lbs, making the 19-pound weight loss for the new model slightly less spectacular than the claimed 33. 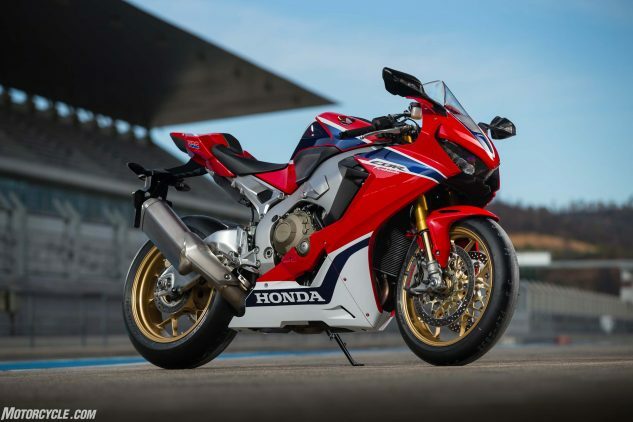 Before you get too disappointed, remember the standard and SP models I personally put on the scales were both Euro-spec models, and the 33-pound weight difference cited by Honda is compared to the Euro-spec 2012 C-ABS model the manufacturer itself claimed to be 465 lbs. 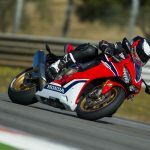 Nonetheless, Honda says the new Blade improves its power-to-weight ratio over its predecessor by 14%, while jumping a huge 65% in the power-to-weight department compared to the original 1993 CBR900RR. 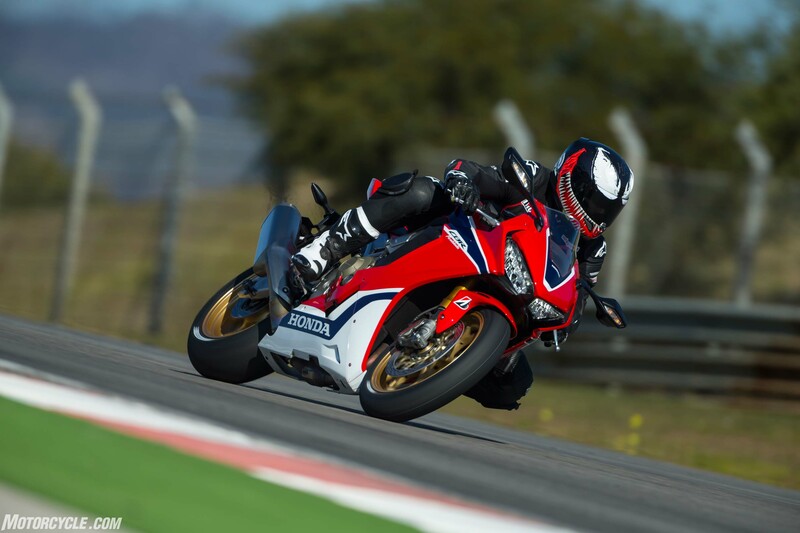 There’s a lot to cover with the 2017 Fireblade, so to help get you up to speed, click these links to get a run down of the changes applied to the standard and SP versions of the CBR1000RR. 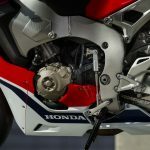 After reading both those stories, it’s worth delving more into Honda’s electronics package for the CBR, as the concept of Total Control, while simple in theory, is quite complex in application. 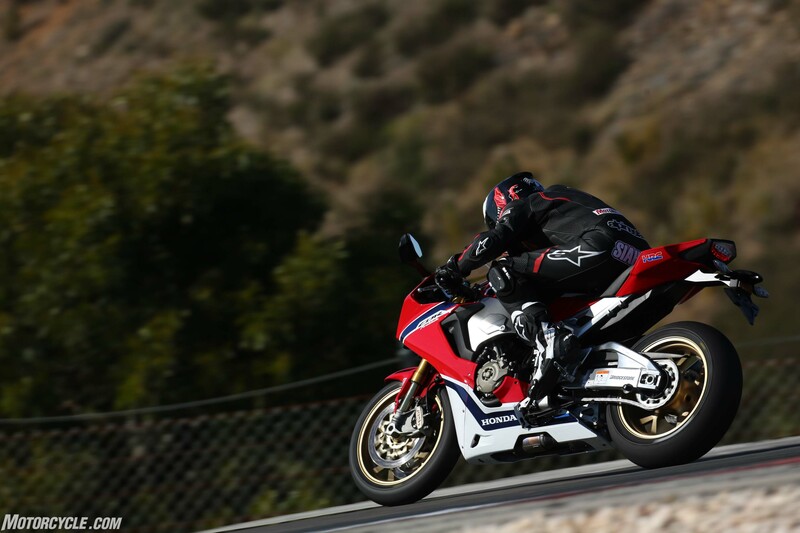 Honda has long made inspiring chassis, and the new CBR1000RR carries on that tradition. It made refamiliarizing myself with a track I hadn’t seen in several years that much easier. 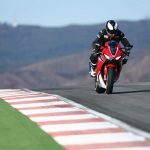 At the heart of it all is a Bosch IMU sending signals from five axes to the bike’s Honda Selectable Torque Control (Honda parlance for traction control), ABS, and on SP models, the Ohlins Smart-EC semi-active suspension system. 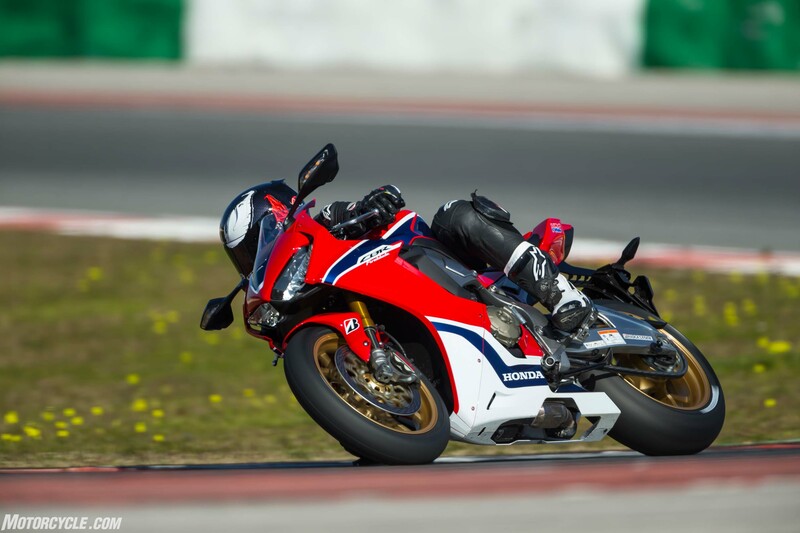 Calculations are happening 100 times per second, using algorithms and software settings developed in-house by Honda. 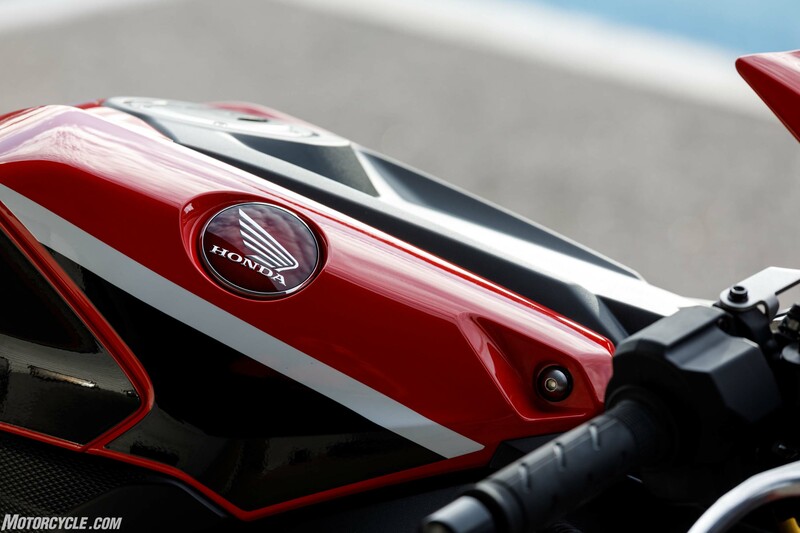 Based on the system used on the RC213V-S MotoGP bike for the street, the HSTC processes inputs from the IMU, wheel-speed sensors, and throttle-position sensor to determine and manage rear-wheel slippage depending on the level chosen from the rider. The levels range from 1-9, with 1 providing least intervention and 9 the most. The system can also be turned off altogether. Wheelie control is tied to the traction-control system, with its three levels directly linked to the HSTC setting – least intervention in the lower three TC levels, moderate intervention from levels 4-6, and maximum intervention from levels 7-9. To make matters slightly frustrating, traction and wheelie controls cannot be adjusted independently other than turning the HSTC system off entirely. 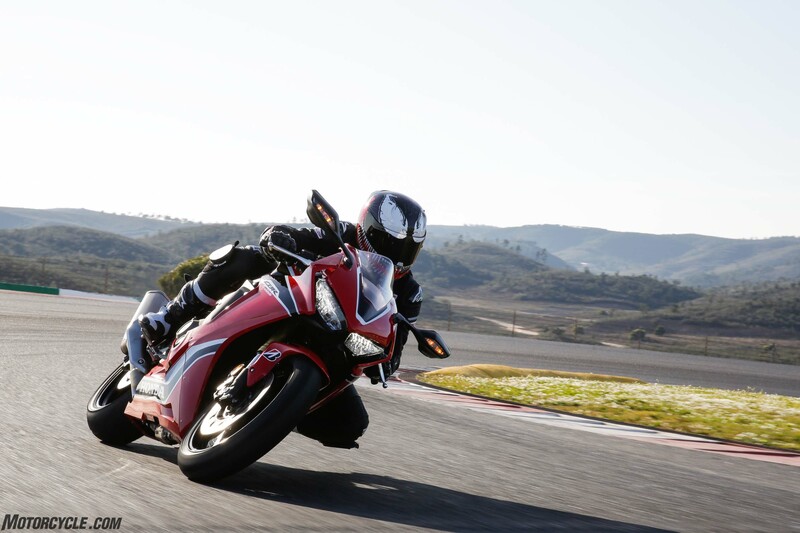 Don’t mistake the Honda Selectable Torque Control (a.k.a. 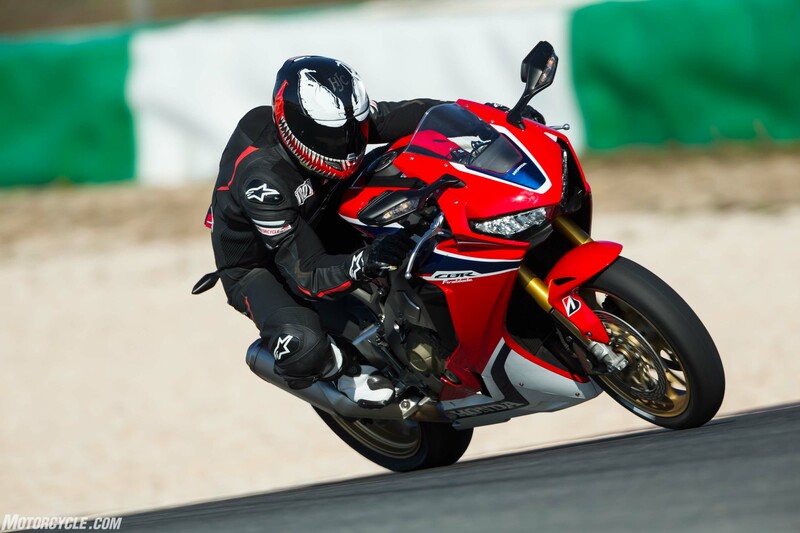 Traction Control) as a highside-proof rider aid in the lower settings; you can still get the rear to slide if you get greedy on the throttle. Toggle up to the higher settings and the ’Blade is nearly idiot proof. Nearly. 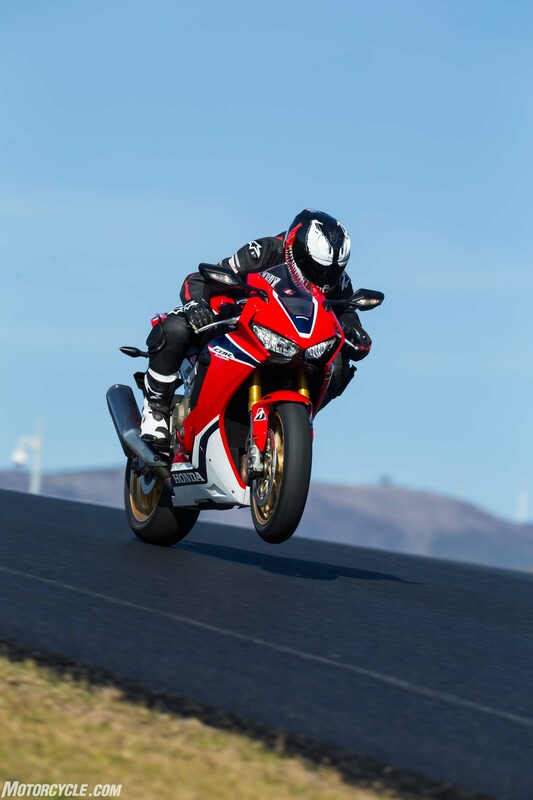 Oddly, despite the CBR coming equipped with an IMU, none of the information it receives is used to detect a wheelie. 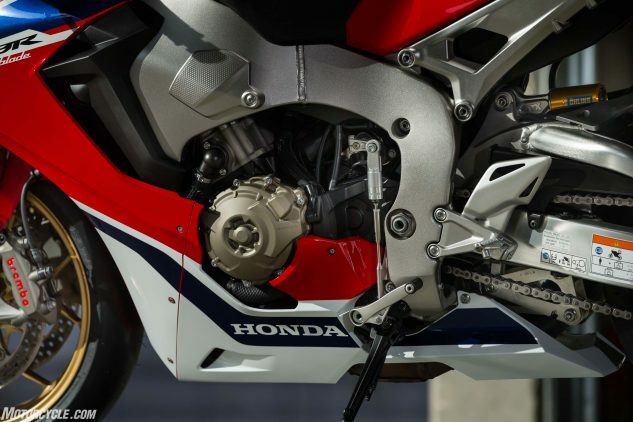 Instead, the CBR relies solely on wheel-speed sensors to detect lift, determining that the front is off the ground once it spins slower than the rear wheel by a certain predetermined rate – a rather draconian way of going about things considering many of Honda’s competitors employ more sophisticated methods using very similar hardware, mainly by incorporating data received from the IMU to manage the wheelie while maintaining optimum drive. The Portimão track is a wheelie-lover’s dream, as its extreme undulations are perfect for hoisting the front in the air. That is, unless you’ve got the Honda’s wheelie control. Sometimes the front will crawl upwards controllably, other times it would shoot up faster than you’d expect before abruptly cutting power. Other times it won’t come up at all. 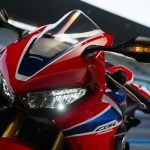 What the IMU does supply input for is Honda’s ABS, which sends IMU information to the Nissin control unit to identify whether the motorcycle is upright or leaned over, and then, depending on how much braking pressure is applied, it can adjust accordingly. 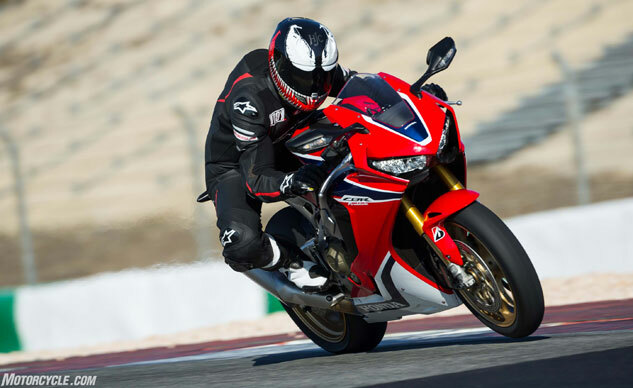 This means that, yes, the CBR1000RR does feature lean-angle-sensitive ABS, allowing the rider to apply the brake mid-corner and, instead of the bike tucking the front, will instead help the rider maintain control. 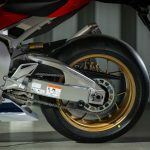 Honda has also employed rear-lift control on the ’Blade, which uses the IMU to send information on the rate the rear is rising, as well as the rate of acceleration in the direction perpendicular to lift. With those two variables, the system operates ABS intervention accordingly. ABS and rear-lift control are integrated with each other and can’t be adjusted independently other than turning the ABS off entirely, which also disables rear-lift control. 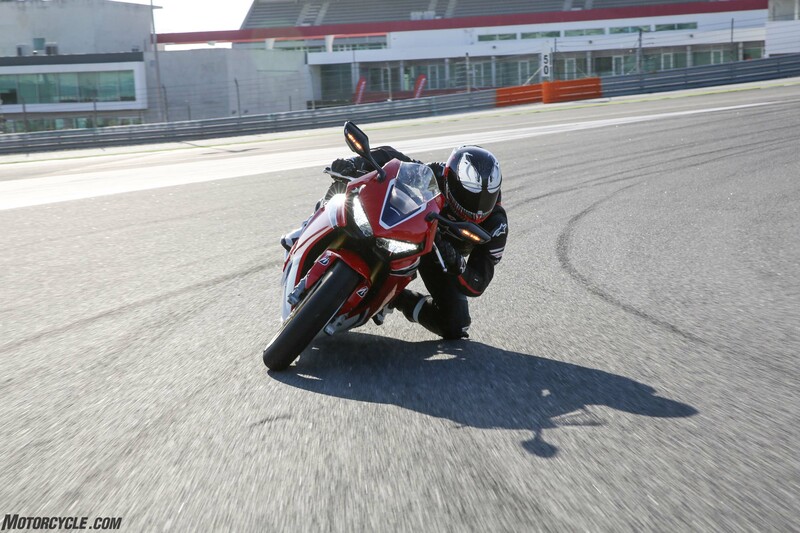 Because the new ’Blade gets ride-by-wire throttle for the first time, the CBR now is able to employ distinct power modes – five in this case. All five levels give the same initial response on throttle opening, but level 1 gives full power, level 2 slightly reduces power in the first three gears, with levels 3-5 reducing power in the first four gears, while also limiting peak power. Selectable engine braking is also a new feature, with three different settings available: 3 providing the least engine braking effect, 1 the most. 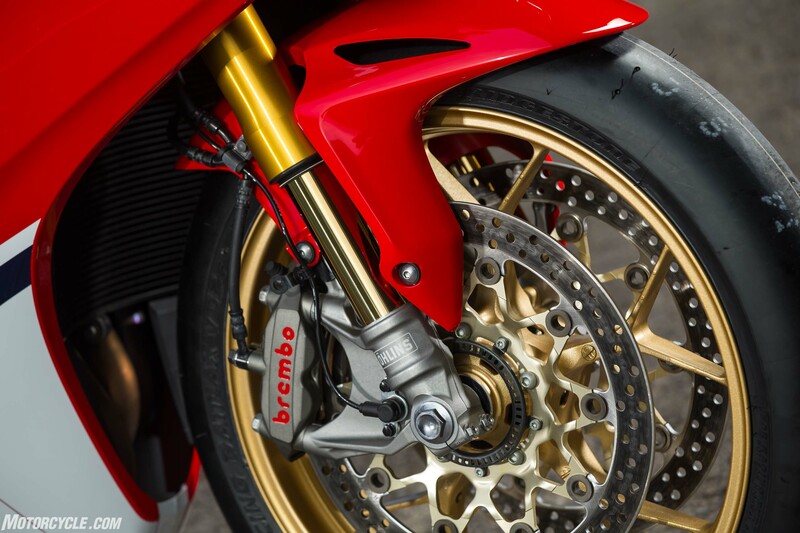 No surprise the Brembo calipers on SP models (seen here) are quite good, but equally impressive are the new Tokico squeezers. Both provide good stomp and feel at the lever, making it easy to trailbrake into corners. Just when you thought that wasn’t enough to talk about in regards to electrons, we haven’t even begun to discuss suspension. Standard models receive a completely analog 43mm Showa Big Piston Fork, while the rear sees the Balance Free Rear Cushion shock, also from Showa. Both ends get full adjustability, but you have to adjust the clickers the old-fashioned way – with tools. 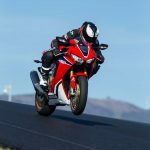 SP models get the latest in semi-active electronic suspension, called the Ohlins Smart-EC (Electronically Controlled) System, using a 43mm NIX30 fork and TTX36 shock. 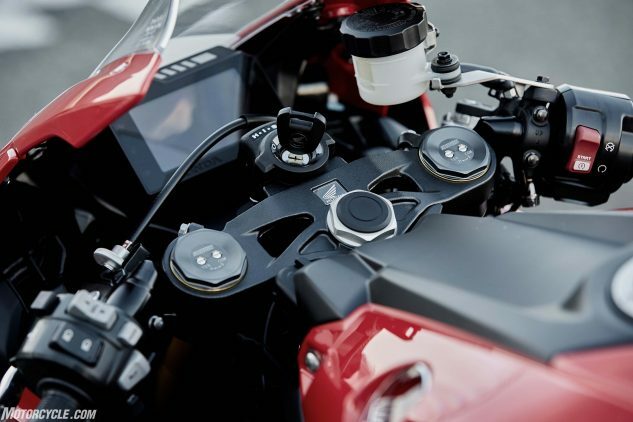 At the heart of the matter is the Suspension Control Unit (SCU) which processes readings from several sources including the IMU, but also works in conjunction with both wheel-speed sensors, throttle-position sensor, ABS modulator, and the suspension pieces themselves to adjust the attitude of the bike in real time. Squeeze the brake lever too hard and the ABS/rear lift control will kick in to keep the rear from getting too high off the ground. 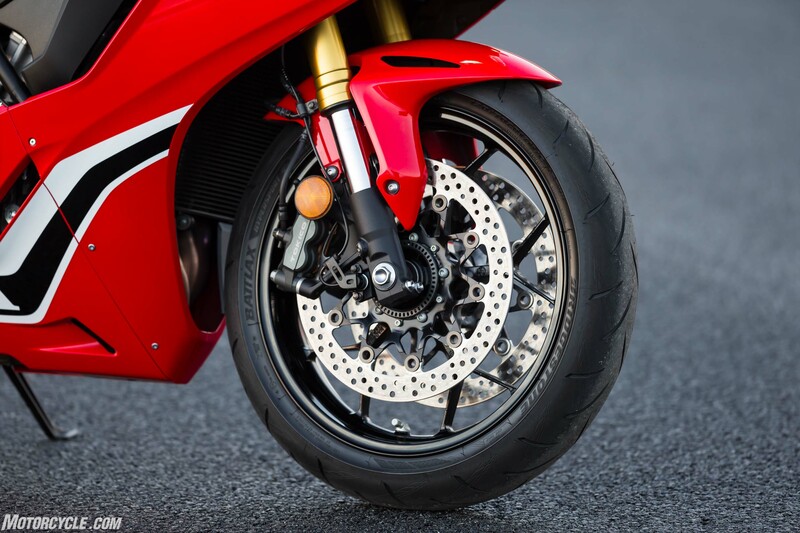 It’s an annoying trait, but at least the slipper clutch and excellent quickshifter help you focus on getting the bike slowed. Now here’s where things get a little complicated. Encapsulating the Total Control ethos, the electronic suspension has two user-selectable modes: Manual and Automatic. Within each mode are three more user-selectable sub-modes: M1, M2, M3 and A1, A2, and A3. 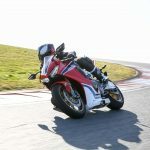 Manual mode and its three sub-modes feature pre-defined suspension settings depending on whether you’re track riding (M1), canyon riding (M2), or simply street riding (M3), with a bias towards handling or comfort depending on which direction you choose. Further fine tuning of the rebound or compression damping in either of the three modes apart from the factory presets is possible by the rider with a few button presses on the dash. 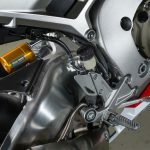 However, since suspension tuning is considered a black art by many, Honda and Ohlins together set out to create a new way of thinking about motorcycle suspension without needing to know the vocabulary associated with it. 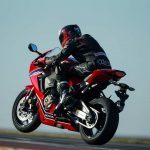 Under this new paradigm, suspension tuning is thought of under three objectives: acceleration, braking, and cornering. Different things are required in each condition and sometimes analog suspension tuning compromises one area for the other. 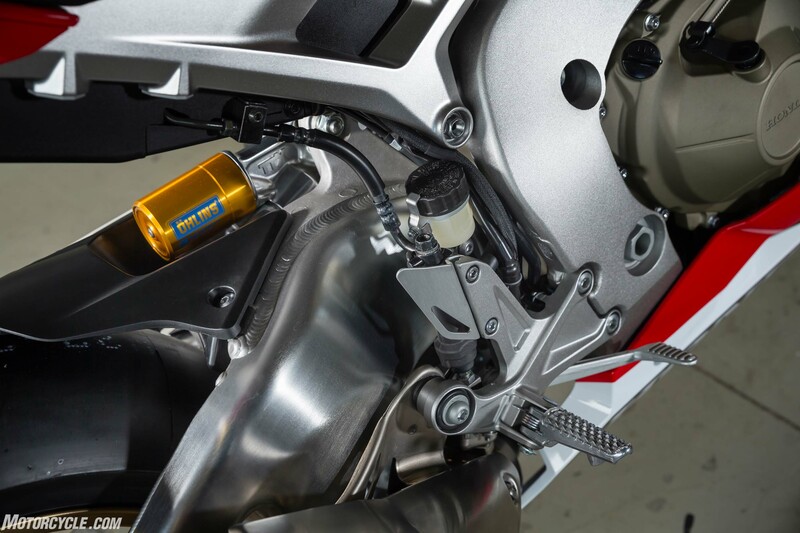 With the S-EC, Ohlins is claiming to offer a suspension setup with no compromises: the support you need under braking, the optimal turn-in geometry, stability at max lean, controlled weight transfer at the start of corner exit, and maximum grip as power is applied while finishing a corner. 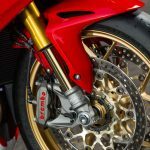 SP models get the upgraded Ohlins S-EC suspension and Brembo caliper over the standard bike’s Showa BPF and Tokico caliper. Wheels are the same cast units between the two, except standard gets black, SP gold. Forged wheels are saved for the limited-edition, SP2 race homologation version. Note also the Bridgestone V02 slick tire seen here. 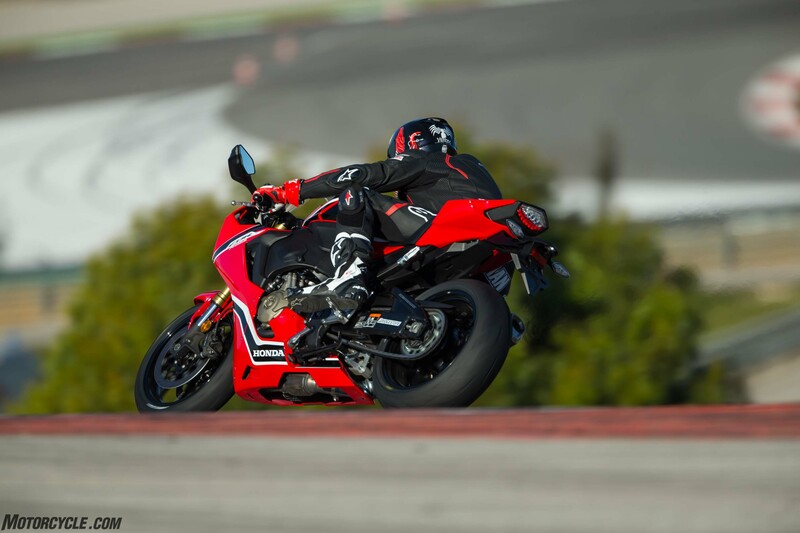 Pay no attention to it as the SP will be sold with B-Stone’s RS10 tire instead. Like the Manual suspension modes, the Automatic mode also has three sub-modes, each with their own default settings for track riding (A1), canyons (A2), and street (A3). The difference is that you can change the settings for each mode based on the bike’s overall attitude instead of just adding or subtracting rebound or compression damping. There are four areas of tuning the user can toggle through for adjustment: General (overall firmness character), Brake (nose dive character), Cornering (turning character), and Acceleration (pitching character). A1 mode allows the user to adjust all four parameters in individual increments numerically. For example, +5 (firmer) and -5 (softer) are the furthest deviations you can make from the standard default settings. A2 and A3 settings only allow General and Brake parameters to be changed. Unlike Manual mode, adding or subtracting from any of the four categories doesn’t change one thing, like compression or rebound. Changes are electronically made at both ends depending on the selection(s) you’ve requested. All changes are navigated through from the full-color TFT display. With so many options and sub-options to choose from, ironically the idea of Total Control seems anything but. 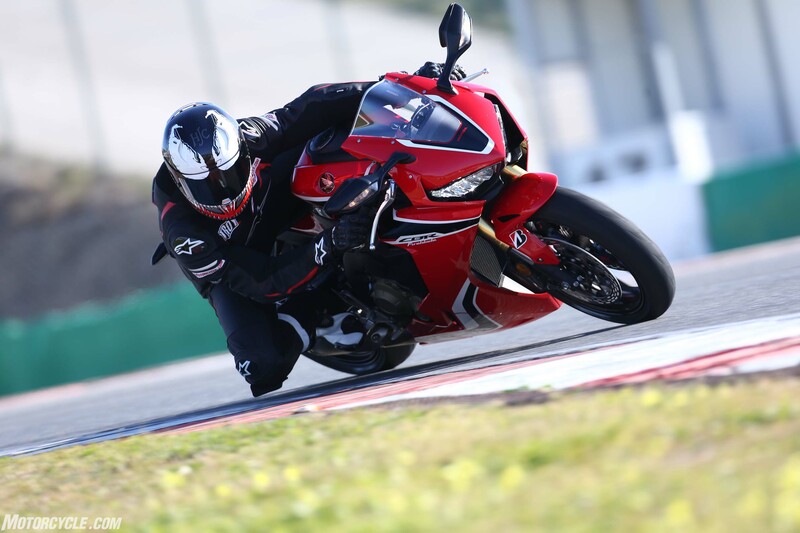 Quickshifter comes as standard equipment on the SP (optional on the base model) and works flawlessly, especially during downshifts. With it, the only need for the clutch is at a stop. 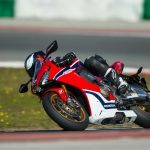 Honda says wall thickness of the frame has been reduced not only to save weight, but also to provide optimal chassis flex characteristics. From where I was sitting, all I could tell was the new chassis felt as agile as ever. What’s It Like In Anger? 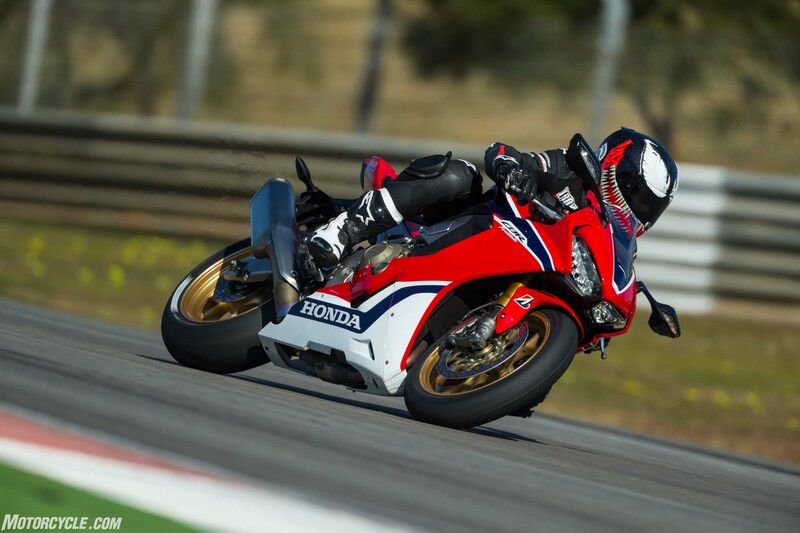 During the track portion of our 2015 Six-Way Superbike Shootout, the Honda was admired for its sublime chassis, but it was ultimately roasted for having the least power by a significant margin. A couple years on and we have a new year, a new administration, and now a new and heavily updated CBR. 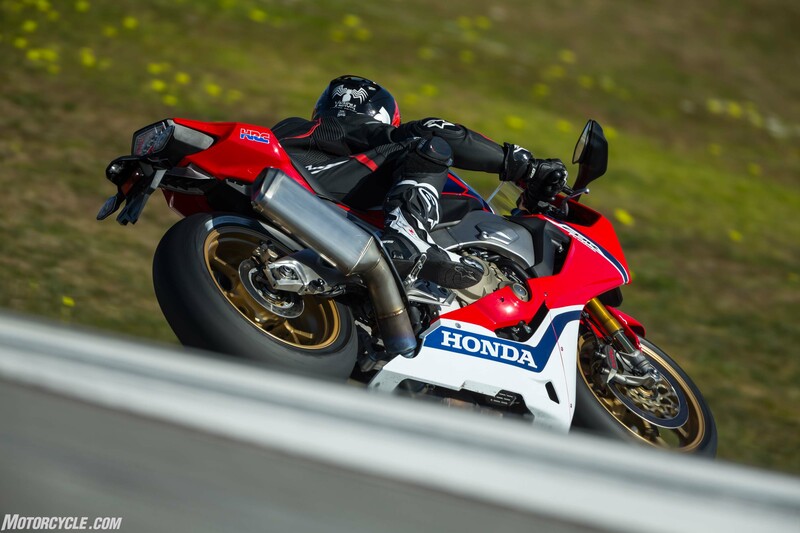 Horsepower is up by more than 10, according to Honda, while weight has also gone down. 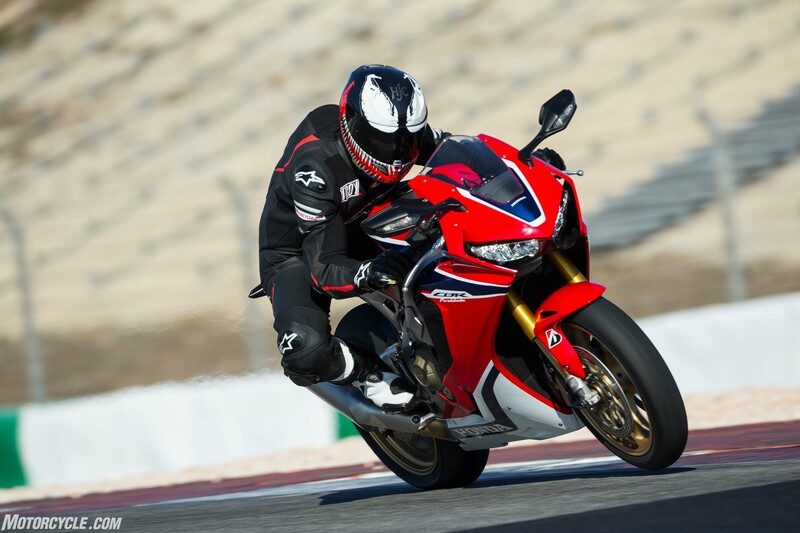 Both are ingredients that make for a good sportbike, and in that regard, the Fireblade is worlds better than before. Granted, it’s been some time since I rode the previous CBR, but the new bike hasn’t lost a bit of the old bike’s midrange, while it definitely pulls harder up top with very nice over-rev. 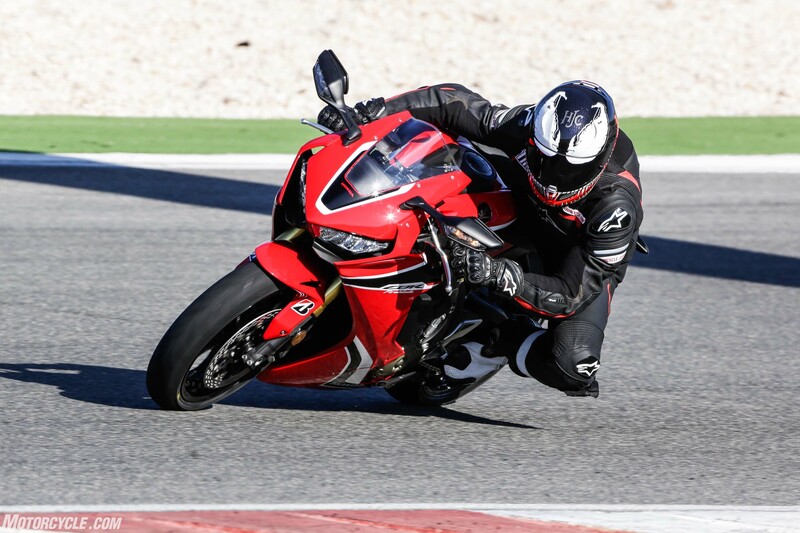 For the first two sessions of our day at Portimao, we were sent off on the base CBR fitted with the standard Bridgestone S21 tires. 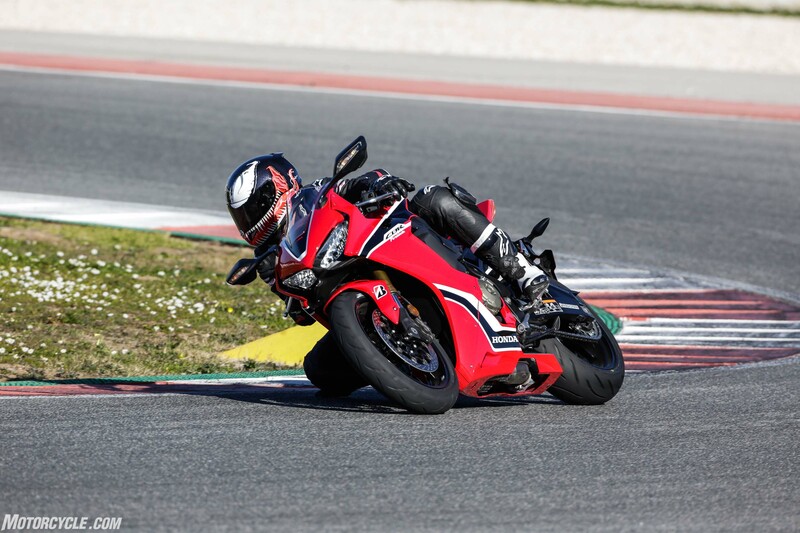 A street-oriented tire more so than a track tire, its profile helped highlight the light and flickable nature of the 1000RR chassis; it almost felt as easy to toss around as the 600RR. 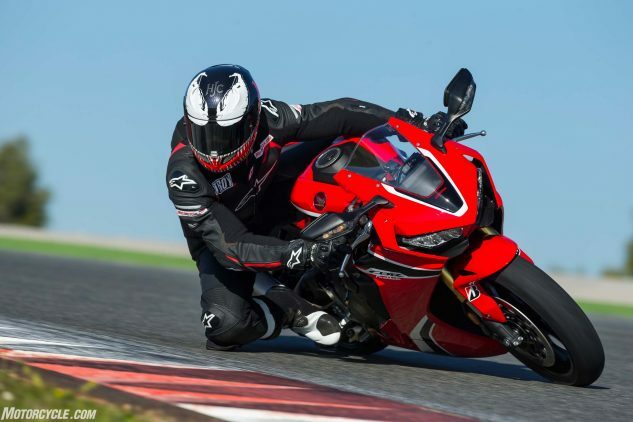 It’s a comparison made often when comparing sportbikes, but in this case, the distinction between the two is getting as close as it’s ever been. 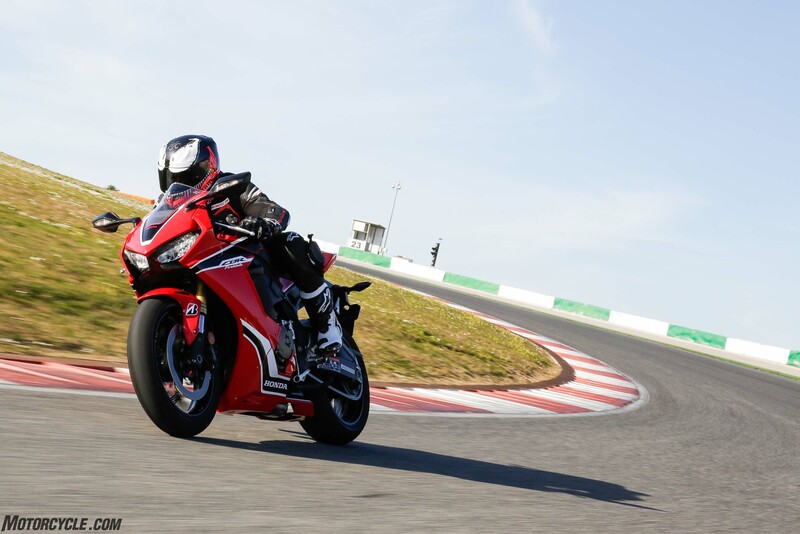 Even with the standard Bridgestone S21 tires, as fitted to the standard CBR seen here, the ’Blade is able to lap a racetrack very quickly. 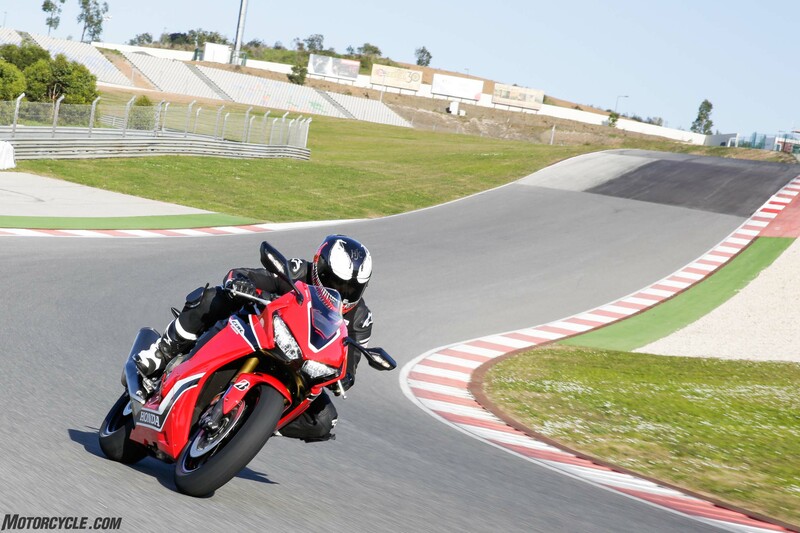 In fact, I’d estimate it’s a perfectly suitable track tire for all but the fastest track riders out there. The V02 slick tires fitted to the SP models have a different rear profile than the RS10 tires normally fitted to the SP, so its turning characteristics don’t exactly apply here. However, its slightly heavier steering feel was more than made up for by the grip the slicks provided. The factory quickshifter is, without doubt, the best unit I’ve sampled so far. 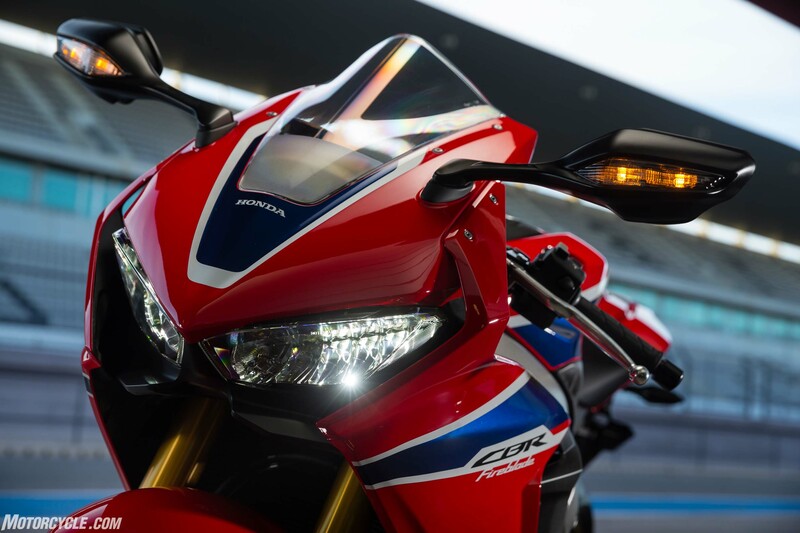 An option for the base model (which the bikes at the launch were fitted with) and standard on the SP, it’s adjustable on three levels depending on the amount of load you prefer to place on the lever, and it operates both up and down changes, rev matching quickly and perfectly every time you ask it – which is not something I can say for some of the Honda’s competitors. 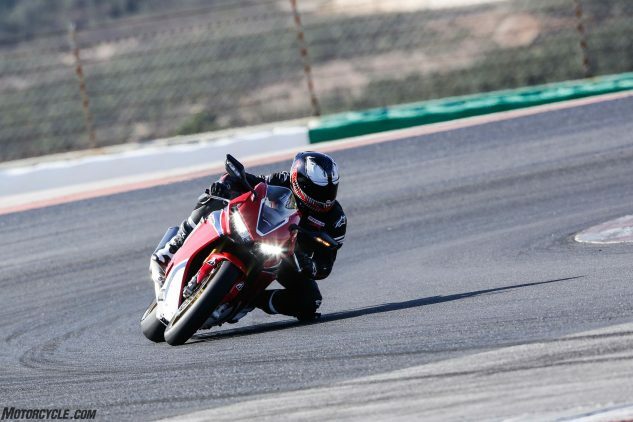 A redesigned slip-assist clutch is 10% lighter than before and also works well, keeping the rear wheel under control and allowing little mini supermoto slides the few times I accidentally backshifted to first while setting up for Portimao’s downhill turn 3. Ergonomically, the new CBR is noticeably slimmer than before – especially between the knees. There’s plenty of room front-to-back as well. For my 5-foot, 8-inch stature, the bars felt a little too far forward for my taste, but the taller riders on the launch seemed to like it. Another minor quibble: the windscreen forms a V shape at its apex, and in a tuck I noticed an unusual amount of wind buffeting atop my helmet. Were it mine, a broader, or double-bubble screen would be one of my first modifications. 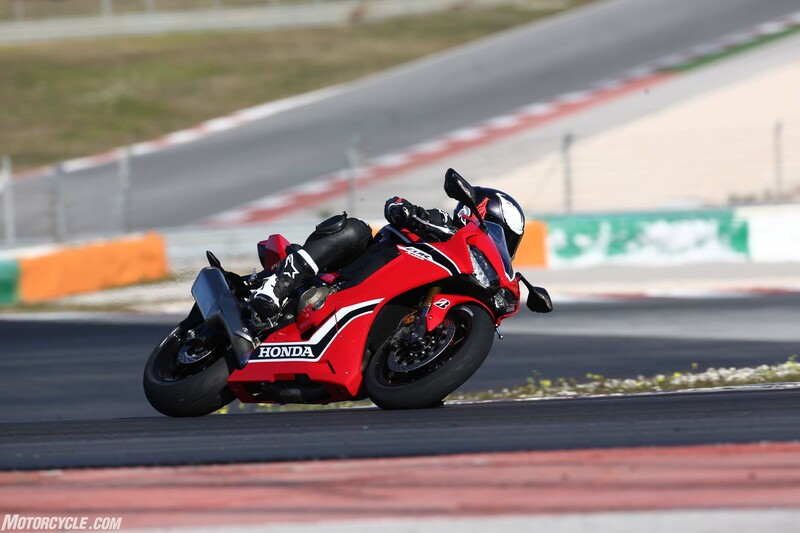 So far, anyway, the CBR has been what I expected from the updated machine – lighter, faster, more powerful, without any lost handling abilities. The road block comes once the electronics are called into action. 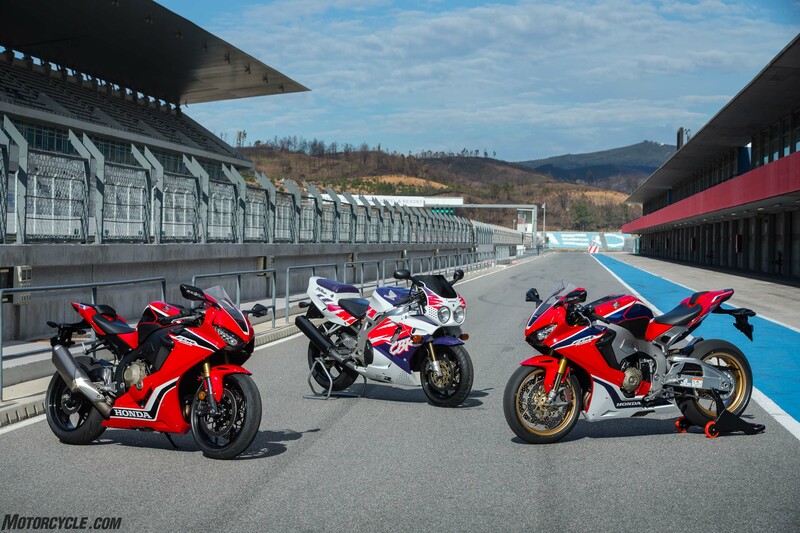 Earlier, I mentioned how the CBR1000RR and CBR1000RR SP felt a bit unpolished. Now that you have a better understanding for the machine’s electronic components, I can better explain what I mean. The scenario explained at the opening of this review, about the wheelie floating before shifting to sixth and bringing it back down, was a one-time occurrence. The wheelie itself happened lap after lap, but the motorcycle reacted inconsistently in its attempts to tame it. Once the wheel sensors detect a wheelie is occurring, it’ll drastically close throttle butterflies to bring the tire back to the ground, and it’s far from a smooth retardation of power. Instead it’s almost as if you’ve run out of fuel for a moment. 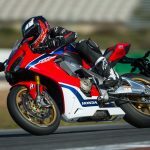 It seemed odd that Honda would opt not to incorporate IMU data when factoring wheelie control, and the result on track proved it. Sometimes big wheelies were allowed, other times the front hardly lifted. As far as controlling rear tire slides go, the HSTC seemed to operate as advertised. With the traction control in its lowest setting, I was able to get the standard bike’s S21 rear to slide a little with too much throttle coming out of a tight hairpin. It was to the point where a highside would have occurred had I not backed off the gas. Conversely, experimenting in setting 8 of 9, whacking the throttle open in any turn while leaned over meant you weren’t getting any power until the bike was upright. On the SP fitted with soft-compound slicks, slides weren’t an issue, so TC didn’t get much of a workout except when wheelies were involved. I got caught up behind some old guy with “Spencer” written across his Honda-branded leathers. They tell me he was pretty good back in the day. 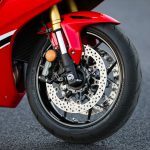 Electronic frustrations continue when it comes to braking, as the Tokico calipers on the base model and Brembo units on the SP provide excellent stopping power. However, in the confines of a racetrack, where hard braking is a regular event, the rear lift control feature intervenes far too often. The result is a pulsing brake lever similar to ABS activation at points where it wasn’t warranted. This isn’t just my own opinion, as nearly all the other journos within earshot were commenting about the same thing. More than one tester, myself included, blew a corner while braking because the pulsing ABS activation to control rear lift meant there were moments where the pads weren’t squeezing the disc even though fingers were firm on the lever. The answer would be to simply turn off ABS, but that wasn’t something we had time to test. 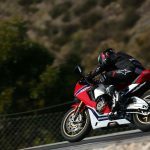 We were short on time because Honda really wanted everyone to sample the Ohlins S-EC on the SP models to get a feel for the differences each A1 change can make. In reality, there were far too many setting changes available for the time we had allotted, so the plan instead was to experience extremes. After riding a few laps in the default settings, the General A1 settings were changed to +5, the firmest setting. The result was a bike that felt stiff as a board, diving what felt like a minimal amount under braking and squatting a minimal amount on corner exit drive, too. 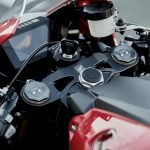 Ohlins S-EC gives the SP rider a multitude of options to adjust their bike to their liking, but we might have reached a point where we’ve got too many choices. Conversely, switching to the opposite extreme, General -5, gave predictable results. The CBR suddenly felt like a Cadillac in comparison. Both ends were too soggy; the front providing zero confidence while leaned over and the rear squatting quite a bit under acceleration. So much so I had to give less throttle than I normally would have exiting certain turns. From there, none other than 500cc Grand Prix legend Freddie Spencer dialed in the A1 settings he liked on his bike over to mine. 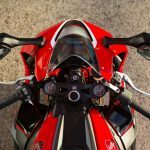 It involved some slight deviations from the default settings in the various categories, but the resulting feel from the bike was noticeably better than even just the default settings. All with just a few toggles and button presses. No more bloody knuckles. In the end, the suspension tuning experiment was an eye-opener to the systems capabilities, but we hardly scratched the surface of the system’s functions. We simply ran out of time. 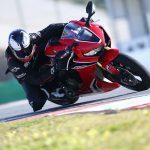 Coming into this First Ride review of the 2017 Honda CBR1000RR I had really high hopes. 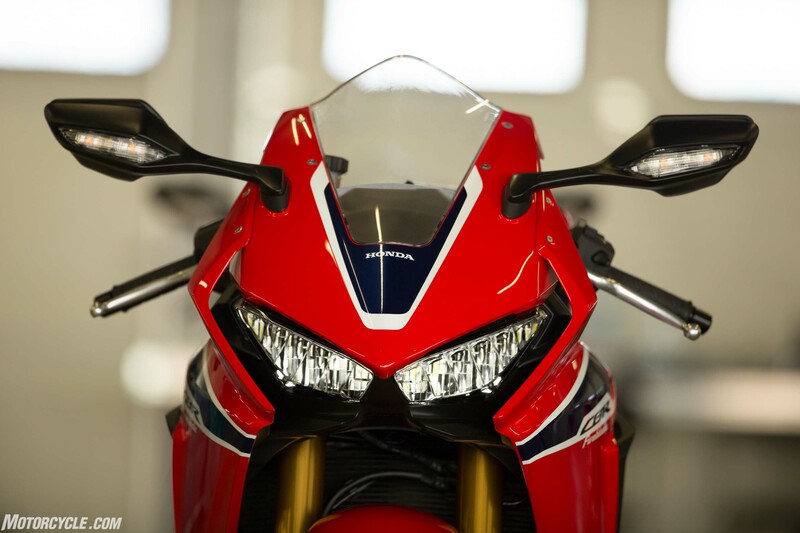 The premise of the CBR we know and love, now rid of the power deficit it had before, was drool-worthy. Add some IMU-based electronics and the might of Honda developing it, and it was sure to please. 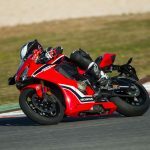 The reality was that, while certain areas of the CBR are much better than before, its electronics aren’t at the same level as the rest of the motorcycle. 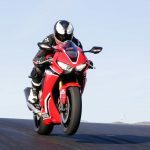 That said, I’m a fan of the new bike’s engine and chassis – both are really good – and aesthetically I think the new ’Blade is one of the best looking sportbikes out there. Who knows, if an aftermarket tuning company can reprogram the ECU to incorporate software that uses the full might of the IMU, I think the CBR could be completely transformed. As it stands, however, I’m perplexed by the ’Blades few shortcomings, as it detracts from an otherwise solid track missile. 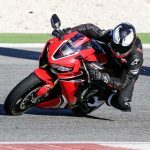 A short summary of the CBR1000RR and CBR1000RR SP: they are great motorcycles with a few glaring flaws. Thankfully, those flaws come down to software and not hardware. 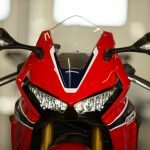 Meaning some rearranging of the ones and zeros has the potential to transform Honda’s flagship production sportbike. 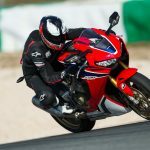 Pricing for the 2017 CBR will start at $16,499 for the base model sans ABS. Adding ABS, the total comes to $16,799, while the SP model can be yours for $19,999. 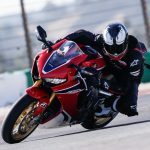 Now that the new CBR1000RR is here, and the new Suzuki GSXR-1000 (and GSXR-1000R) will be ridden by the world’s press next week, it seems to me like another literbike shootout is in order – and we’ll be sure to bring it to you as soon as we can. Stay tuned. 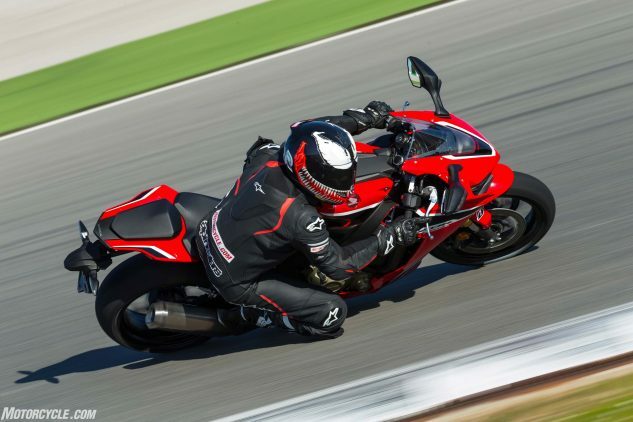 Get price quotes for Honda CBR Sportbike Family from local motorcycle dealers.